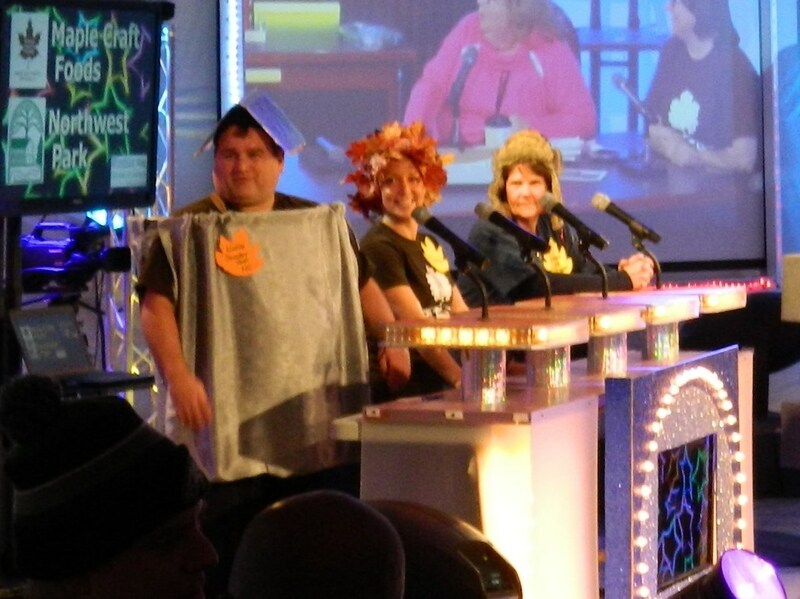 Host Jerry Wistrom quizzes team contestants from St. Gabriel School and Windsor Federal Savings. An evening of fun and fundraising marked the 15th anniversary of the Windsor Feud held Saturday, March 3 at the Windsor, Connecticut town hall. Based on the popular television game show, Family Feud, teams from area businesses and civic groups participated in the friendly competition organized by the Windsor Chamber of Commerce with team Hampton Inn named the 2018 champs. Through pledges, the event raises money for numerous WCofC community, education and business programs. According to Jane Garibay, executive director of the WCofC, as of March 7 a tally showed the event had raised $7,000. “Still rallying up,” added Garibay. Inside the town hall, council chambers was transformed into a realistic replica of the T.V. show. Garibay said – on a volunteer basis and motivated purely by the enjoyment of the task and assisting with the event – the set was designed and built by Gary Dowgewicz with help from Bill Karlon and his wife Allyssa. 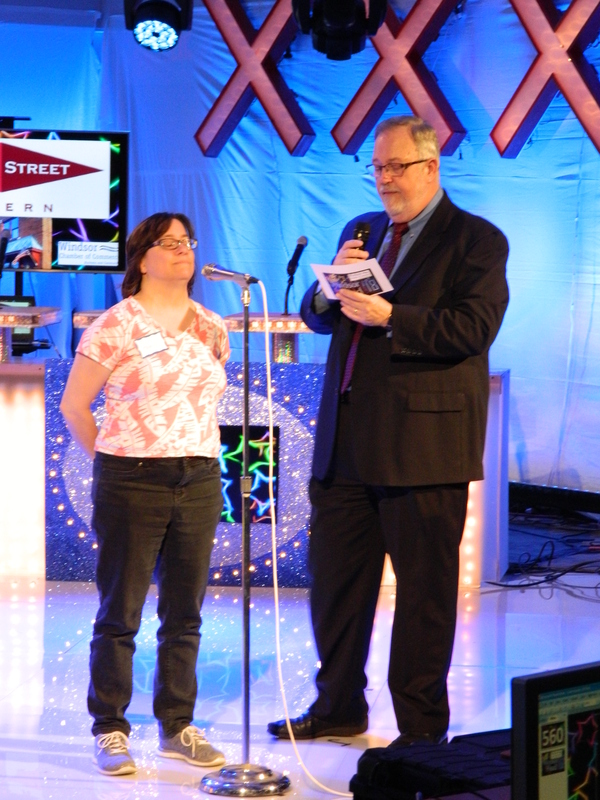 Paula Pierce playing in the Fast Money round. 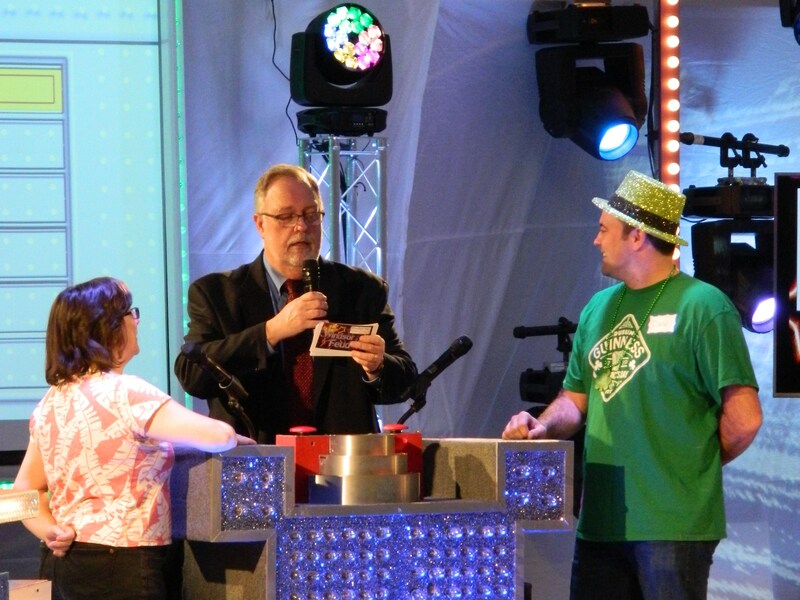 Ten teams competed in the Windsor Feud which ran from from 5:30 p.m.- 9 p.m – Windsor Federal Savings, St. Gabriel School, Kiwanis, Diamond Club Coaches, Union Street Tavern, WCofC, Hampton Inn, Hollywood Suites, Maplecraft Foods/Northwest Park. Teams taking home trophies were: Smartest – Hampton Inn; Richest -St. Gabriel School: Best theme – Hollywood Suites: Honorable Mentions – Maplecraft/NorthwestPark & Kiwanis Club. Jerry Wistrom, who has served as host since the first Windsor Feud, was praised for displaying wit and charm in performing his duties. He noted the event keeps getting better every year. For those who may not be familiar with the game, 100 people are are surveyed with various queries and the feud players are later asked to guess the most frequent answers. 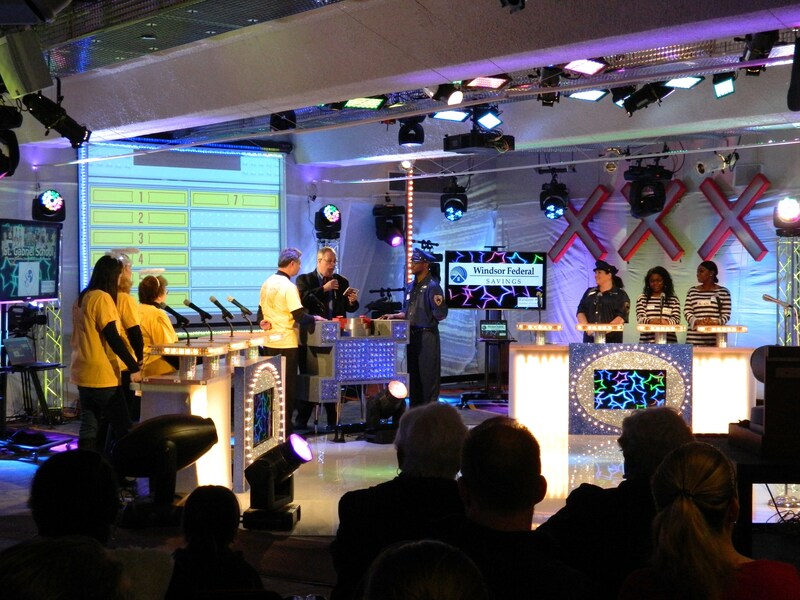 The more correct responses given by contestants, the more corresponding points are earned by their team. Whichever team wins the most points then sends two contestants to the Fast Money round. “It’s harder than it looks,” said Father John Melnick of the St. Gabriel’s School team. Survey number one asked players to “name something for which people want quick relief.” The top response – headache – followed by heartburn, stomachache, back pain, debt, toothache and a cold. Another survey wanted to know about,”Something that Ireland is famous for.” Among the things that popped into the minds of feud competitors: shamrocks/clover, whiskey, leprechauns, the Blarney Stone, potatoes and the color green. 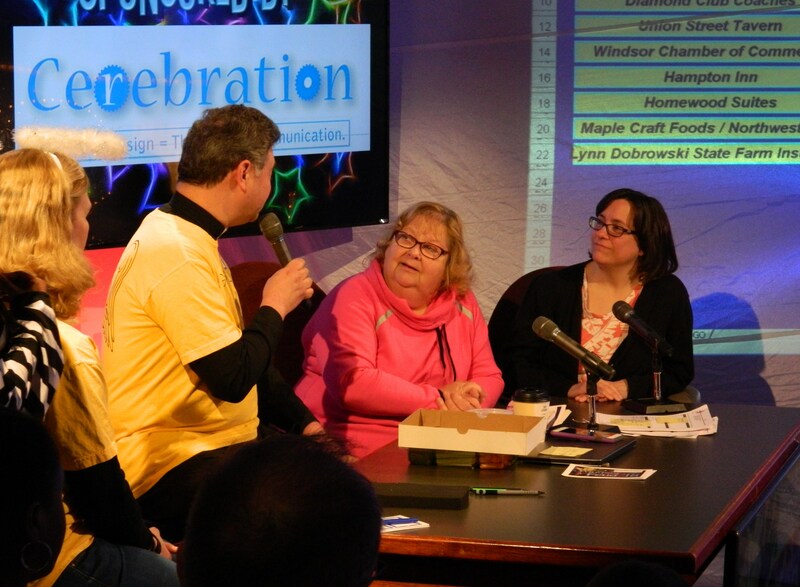 Jane Garibay and Paula Pierce of the Windsor Chamber of Commerce interview Father John Melnick from the St. Gabriel School team during a break in the competition. The local community cable station WIN-TV broadcast the Windsor Feud and it also streamed on http://www.Win-TV.org – some players took the chance to say hello to family and friends watching from as far away as Colorado and Florida. The fun was not limited to the on-camera answers but extended to a full house in the audience where some were grooving to the piped-in sounds of Earth, Wind & Fire, during the breaks when new teams took to the podiums. It was during those breaks that Garibay and WCofC member Paula Pierce accepted phone-in pledges and interviewed contestants. During an interview with Father John Melnick, St. Gabriel school’s designation as a Blue Ribbon school was cited. Seven of the ten teams raised more than $400. The amounts above $400 will be donated to charities of their choice. Go to https://windsorcc.org/ to learn more about WCofC events and activities.